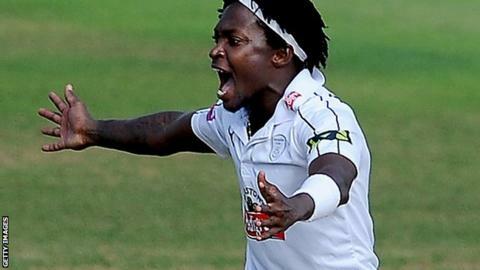 Hampshire fast bowler Fidel Edwards admitted the side "showed their class" by escaping relegation from Division One of the County Championship. Hampshire won three of their final five matches as they stayed up by two points at the expense of Sussex. Edwards played a pivotal role taking 45 first-class wickets in eight matches. "I'm so happy right now. I don't know what it feels like lifting a cup, but this probably feels just as good, if not better," he told BBC Radio Solent. Edwards, who signed a new contract with the county earlier, took 10 wickets as Hampshire beat Nottinghamshire by eight wickets at Trent Bridge to give themselves every chance of avoiding the drop. They had to wait nearly three hours before their survival was guaranteed as Sussex lost by 100 runs against champions Yorkshire at Headingley. "To come here (Trent Bridge) and win was a great effort where we showed our class," Edwards added. "It's a great feeling to be staying Division One. It's been a good team effort and we're really happy right now. "Come next year, it's going to be hard to beat us." Speaking as the team returned to the south coast from Trent Bridge by bus, opener Jimmy Adams described their turnaround in form in the closing weeks as "up there with anything I've experienced in cricket". He said: "Getting Fidel Edwards back from the Caribbean Premier League and the addition of Ryan McLaren, plus the form of some of our batsmen certainly helped. "We got ourselves into the position where we had to find wins, plus we were very poor in the middle part of the season. But, it's been a crazy six weeks that's turned our season around." All-rounder Liam Dawson, who spent time on loan at Essex earlier in the season, said Hampshire had risen to the challenge of Division One as the season progressed. "At the start of the year, we didn't perform," he added. "The wickets we played on towards the end were flatter and I think with our attack, we adjusted. Next year, we'll stand a good chance in the division."